Today I’d like to take a more serious look at how you can use Fiverr.com to help your business than the more comical one in last post. One thing I’ve used Fiverr for in the past, with some good success, is graphic design. There are a ton of graphic designers on Fiverr offering all sort of different services…logo design, banner ad design, custom cartoons, photo retouching, website header design, etc. 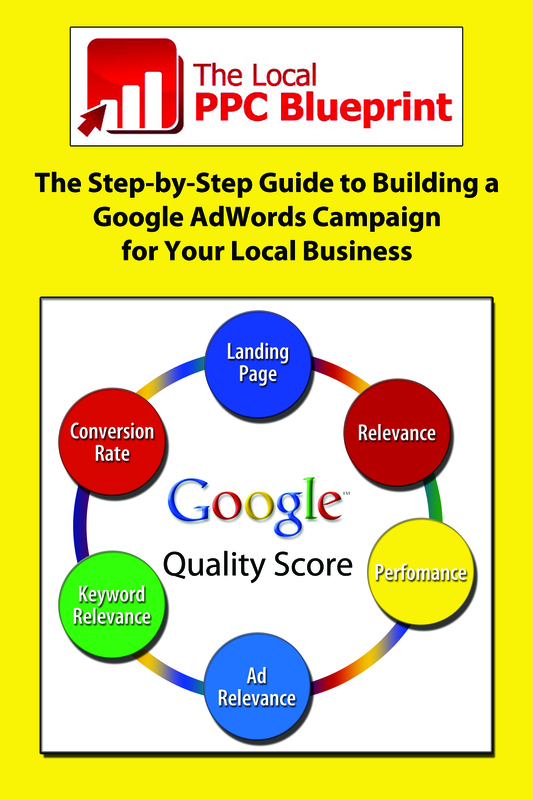 I’m developing a course, The Local PPC Blueprint, which is a step-by-step guide to setting up a Google AdWords account for a local business. I’ll need a logo and an eBook cover for the course. Nothing fancy, just something professional looking. 1. For the first gig, I got 7 custom logo concepts developed. This was an “Express” gig on Fiverr and, exactly 7 hours 59 minutes and 19 seconds after ordering it, I had my logos. So, in all, I spent $15 and, within 24 hours of placing each order, got the finished design back. I’m not crazy about any of the logos above. Though I think a few of the logos have potential and could be tweaked into something I’d be happy with. And I think the eBook cover is dreadful…I don’t like the yellow background at all and I’m not sure that I can (or want to) use Google’s logo on it. But it only cost $5 so no big loss. So what have I learned from ordering these, and other, graphics gigs on Fiverr? 1. The more direction you provide the sellers about what you’re looking for, the better your chance of success. I provided very little direction to the sellers above and the results reflect that. Even just providing some samples of company logos you like to a seller would be very helpful in guiding the finished product you receive. 2. If you need high quality, custom, original graphics done that reflect your business/product/service, Fiverr isn’t the place for you. To get that level of attention and service, you need to spend the money to hire a skilled professional designer for a lot more than $5! 3. Fiverr’s great for generating ideas and brainstorming. For $20, you can hire 4 different people for your graphic design project and get 4 different concepts. You may end up with either a concept or two you can run with or, at the very least, have something you can use as a starting point. And, if not, you’re only out $20. Very little downside here! 4. The most successful graphic design gigs I’ve gotten in the past on Fiverr have been for creating headers for WordPress sites I’ve built. In those cases, I knew the words and images I wanted in the headers but just needed someone to lay it out for me. In a few cases, I went back to the seller to have them make some minor changes to their original work to get it just right (most sellers will do minor revisions at no additional charge). But, overall, I’ve been very happy using Fiverr for this type of work. 5. It’s great for finding people to make simple tweaks to your existing graphics. It’s probably not worth your time to mess around with graphics or photos in image editing software. If you know what you want and it’s pretty straightforward to do, you can find someone on Fiverr to take care of it for you and spare you the time and headaches of doing it yourself. 6. If you need decent graphics fast and cheap, you’ll be hard pressed to find a better place to get them than Fiverr. While you can have success on Fiverr for graphics projects, there are some types of projects I would never use Fiverr for. I’ll cover those, and share some more of the gigs I ordered, in my next post. And, out of curiosity, what do you think about the graphics above? Any stand out at you as being particularly good/bad? Are they worth $5? What Can You Get For Your Business for $5?